With the holidays approaching, I have been thinking a lot about traditions, and about how the social expectations we are raised with shape us. 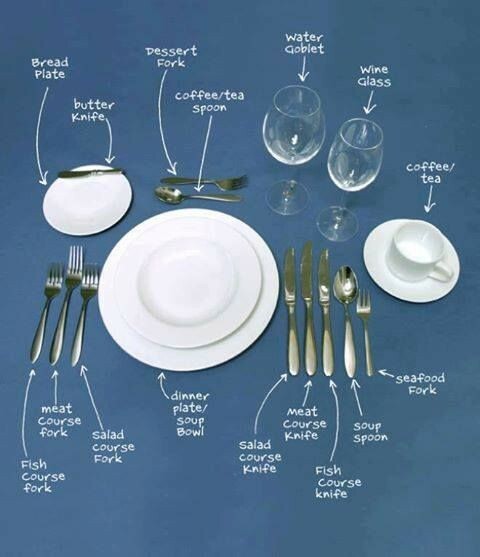 For instance, I know how to set a table appropriately. This is a skill I am proud to possess. My grandmother was responsible for ensuring that I knew that the fork goes on the left, typically on top of the napkin, and the the knife faces toward the plate. She was also responsible for my need to use at least two forks during a meal, frustrating as it may be for the person responsible for doing the dishes at our house. Of course, these rules of etiquette were perpetuated by my mother who had also learned from her mother and grandmother. Though at our own home, in the early 70’s things became a bit more casual day to day, but if needed, my mom could take it up a notch for entertaining. I have made it my mission, often to the dismay of the children in my life, to be sure that they can set a table, and they know which fork to use. If I had a dollar for every time I have hollered from the kitchen, “fork on the left!” I’d be a wealthy woman. Regardless of whether Thanksgiving dinner is served buffet style in a garage on paper plates or seated in a dining room with fine china, they will be comfortable. And, hopefully, they aren’t going to think “dinner out” means that fast food joint with the golden arches hovering over forever. I always loved eating at my grandmother’s. She wasn’t so much eccentric as she was classy. She had beautiful dishes and glassware, and enough silverware to set a table for 30 people, easily. And, she had neat pieces like a little crock teapot and mugs we always used for hot cocoa, a creamer shaped like a cow, and colorful egg cups for soft boiled eggs. The best part was the cloth napkins. Not that there weren’t paper napkins around, but for dinner, they were cloth…see, classy. It wasn’t just the value of a perfect place setting that was passed on to me. My love for nifty kitchen tools came from my grandmother and mother too! Now, here is where I become a bit fuzzy in my memories. I can’t tell you if it was my grandmother or my father who developed my love of poached eggs. However, I can tell you that it was my dad who taught me to poach an egg in a pot of water (the “real” way), but my grandmother who had the nifty egg poaching pan. The pan ensured perfectly poached eggs every time. I have that pan, and I have yet to find anything to replace it. It is old in pan years, probably at least 35, and has a ring around it that shows where the water line is. It’s not fancy, it has no teflon coating or glass lid, but it makes perfect eggs. I can simmer water in a big pot just right with a little vinegar and roll the egg with the spoon as it poaches, but I don’t have to. The other gadget from my grandmother’s kitchen that I posses, a potato masher. No electric mixer used here, and definitely NO boxed potatoes. Seriously, if you do nothing else different after ready this post, please, for the love of food, never make mashed potatoes from flakes ever again. You can set the table any way you want and use the salad fork to eat your entree, but take the extra few minutes to peel and mash your own potatoes. You will be a much happier person because of it. Okay, rant over…back to the gadgets. The final gadget that was passed on to me is a cheese grater set. Nothing fancy, but they are still super sharp (trust me and the missing chunks of my knuckles). The irony in my kitchen gadget journey through the years that has led to me needing more storage space, is that those items I inherited from my grandmother are considered antiquated now. They have been replaced with electric versions twice over, but they are still my favorites. So, as you are enjoying time with family over the holidays, take a few moments to think about the things that have been passed down to you. Whether it be a tradition, a value, or a really cool gadget, those are the things that make you, you. What will you be passing on to your family? ?